Out of all of its case lines, the Spigen Neo Hybrid continues to be arguably the company’s most popular one. Not only has it been around for a long time now, but it keeps on getting evolved with each and every iteration. For its popular case series for the Apple iPhone 6, the Spigen Neo Hybrid case is re-imagined to match the new design of the phone. At its core, the Neo Hybrid case still retains the series’ dual material construction, which is comprised out of a UV-coated hard polycarbonate frame and a high-polymer-coated soft TPU case. Visually, it looks stunning on the phone, as its bezels offer a pleasant contrast to the black rubbery material that dominates most of the case. At the same time, it’s a form-fitting case that doesn’t add a whole lot of bulk – thus, keeping the iPhone 6’s body slim and svelte. 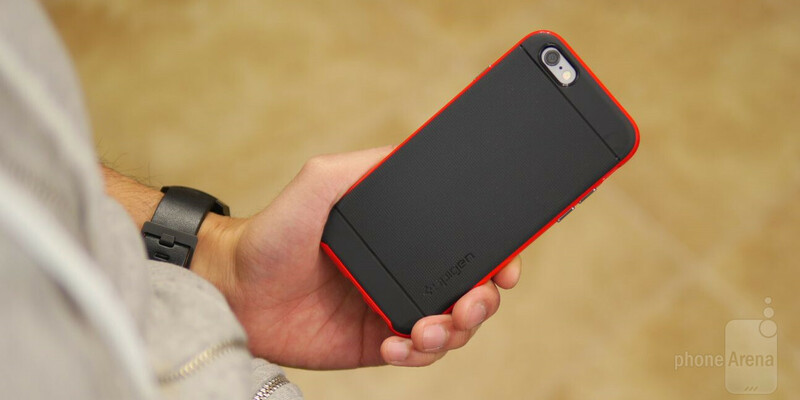 Since it exudes a rubbery finish, the Spigen Neo Hybrid case offers a fair amount of grip when it’s held. And finally, it’s able to maintain a nice clean finish too! There’s also a decent amount of protection offered by the case, one that safeguards the phone from normal wear and tear – as well as some minor falls. Indeed, it’s not something that’s meant to protect it from serious drops, but the inner web-pattern of the TPU material does nicely to absorb and disperse minor bumps and drops. Picking it up won’t cost you a fortune, seeing that you can snag it for as low as $18.22 through Amazon. For the price and all, we can’t complain too much about it – mainly because there’s a stylish and protective quality to the case.